There's no need to pay pricey gym fees to build strength in your upper body and core muscles. All you need is a little space — your basement, spare room or neighborhood park will do — and your own bodyweight to work your arms, shoulders, chest, upper and lower back, obliques and abs. Prime your muscles for action by warming up before every workout. Jog in place or do jumping jacks for 5 minutes to get your blood moving. Then, do a few dynamic stretches for each part of your body you'll be working. For example, to warm up your shoulders, extend your arms out to either side and move them in circles, making the circles gradually larger until you reach full range of motion. To stretch your chest, open your arms as wide as you can, then bring your palms together with your arms straight in front of you. Repeat this 10 times, opening your arms wider each time. To warm up your midsection, do torso rotations, swinging your arms as you rotate to one side and then the other. Do dynamic side bends, leaning to one side and then the other. Knee push-ups: Start on your hands and knees with your hands directly underneath your shoulders. Inch your knees back until your shoulders and hips are in one straight line. 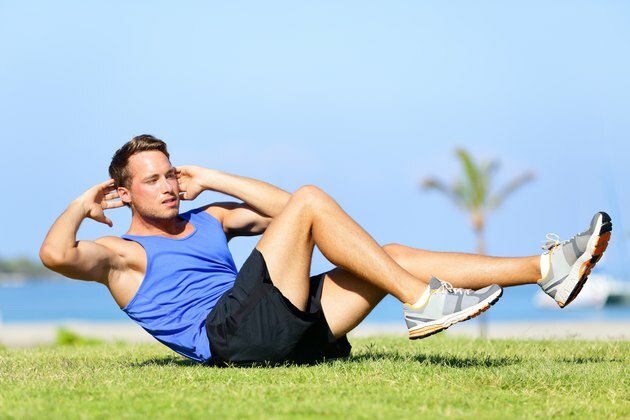 Keep your abs contracted as you slowly lower your chest toward the floor, elbows bending out to either side, but slightly angled in toward your sides. Push back up to the starting position until your arms are straight. Traditional push-ups: Keep your knees lifted and your body in one straight line from heels to head throughout the exercise. Lower as far down as you can without actually collapsing to the floor, then push yourself back up to the starting position. It's essential to keep your abs contracted for the duration. 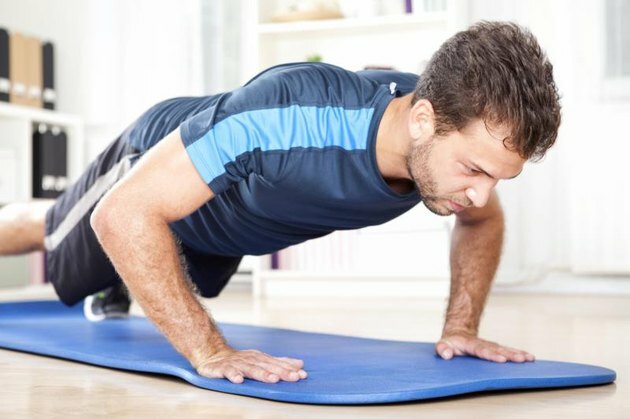 Alternating shoulder-tap push-ups: Perform traditional push-ups; at the top of each push-up, lift one hand off the ground, bringing it across your body to tap the opposite shoulder. Do the same with the other hand. A note on breathing: Exhale during the most difficult part of the exercise. For a push-up, that would be when you are pushing away from the ground. Inhale on the less-challenging part. During a pull-up, that would be as you're lowering your body from the bar. Bench Dip: Sit on a bench with your hands grasping the edge of the bench on either side of your hips. Scoot your hips forward off the bench and walk your feet out just far enough that your knees are bent at about 90 degrees. Slowly bend at the elbows as you lower your buttocks down toward the ground. Stop when you feel a stretch in your chest or shoulders or when your bottom touches the floor, then push back up to the starting position. 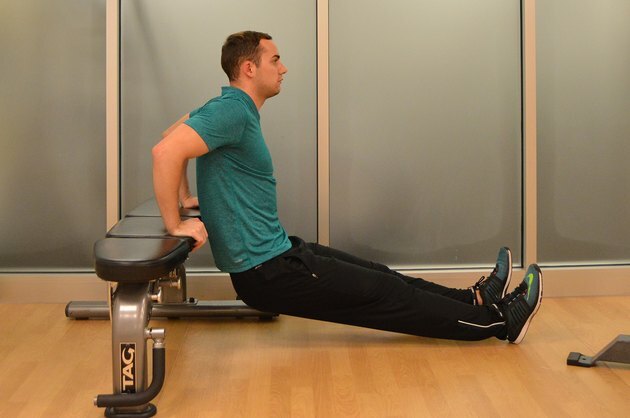 Straight-legged Bench Dip: Extend your feet out on the floor with your legs straight while doing the bench dip. To do pull-ups, you'll need to install a pull-up bar at home or find a bar high enough to do pull-ups at your local park. Pull-ups work your back, biceps, shoulders and even your chest. Choose a variation below (easiest to hardest) and do two to four sets of six to 12 reps. Negatives: Stand on a box and grasp the pull-up bar a little wider than shoulder-width. Jump up so that you easily assume the top position of a pull up. As slowly as youcan, lower yourself down until your arms are straight. Drop down to thefloor from the bar, climb up on the box and repeat. 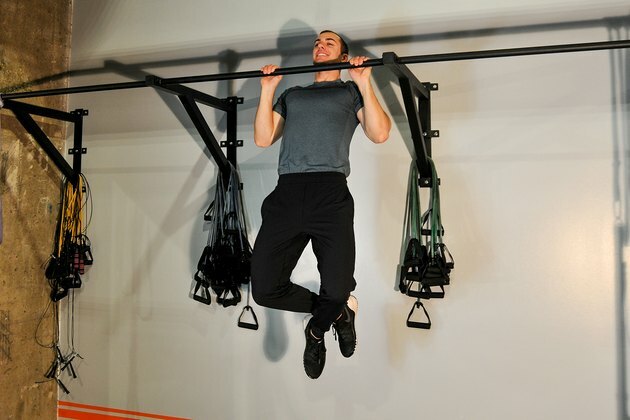 Band Pull-ups: Loop an exercise band around the bar and secure it so one end hangs down like a stirrup. Put one foot in the stirrup and jump up or step up on a box to grasp the bar. Wrap the ankle of the free leg around the ankle of the leg in the stirrup. Slowly bend your elbows out to the side and pull yourself up until your chin passes the bar. Lower yourself back down with control. Traditional pull-ups: Grasp the bar and without momentum pull your body weight up until your chin passes the bar. Lower yourself back down with control. A study commissioned in 2001 by the American Council on Exercise found that bicycle crunches were the best abdominal exercise as measured by electromyography equipment. Do them rapid fire or slow and controlled to work muscle endurance and build strength. Lie on your back on an exercise mat. Press your lower back into the mat and put your hands on your head behind your ears. Lift your shoulder blades off the mat and bend your knees to 90 degrees so that your calves are parallel to the mat. Exhale as you bring your right knee toward your left elbow, extending your left leg and twisting your torso to the right. Inhale back to center and switch sides. Do three sets of 10 to 30, depending on your ab strength. Static hold plank is an isometric exercise that works your entire core. See how long you can hold it without your hips or lower back caving in. Assume a push-up position with your hands under your shoulders. Keep your body in one strong, straight line from head to heels. Puff up between your shoulder blades a little bit. Keep your neck long. Hold for 30 seconds to one minute, or longer. Repeat three times. You can do each of these exercises for the recommended number of sets in a linear fashion, pausing for a rest between sets, or you can do a circuit routine doing one set of each exercise with little to no rest in between sets, then repeating the circuit three or four times. Doing this type of routine will give you a good cardio workout and encourage more fat-burning.